Porsche recommending owners ground their rides for a couple of months. Porsche has issued a second recall for the 918 Spyder, affecting 205 cars worldwide including 44 in North America. All pertinent customers, says Porsche, have been notified but we can’t say for sure whether Jerry Seinfield’s dark blue model was on the list. 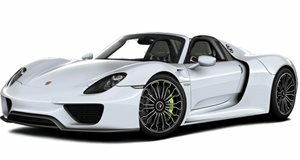 Five 918 Spyders were recalled in the US back in July due to faulty control arms on the rear suspension, which Porsche said could break under racing conditions. The official notice for the current recall states there’s another axle problem. However, this time it’s with the front axle that "was fitted with chassis components from a batch whose durability cannot be guaranteed." Apparently the front lower suspension control arms have a problem this time. There is a chance they could crack and break and “vehicle handling may be impaired” as a result. Porsche hasn’t specified how long the recall fix will take, but it could be to two months before the required parts arrive for the 39 problem vehicles in the US, and the 5 in Canada. In the meantime, the word from Stuttgart is that the cars remain grounded.